WordPress has over 50,000 plugins and finding quality free and premium plugins can be a daunting task to say the least! I’ve been in the WordPress community for over 10 years and I know this first hand. The goal of this guide is to help you save time and money by providing you with a definitive resource to the best free and paid plugin plugins and in various categories. No more spending hours downloading countless plugins just to test and see if they work and no more wasting money buying plugins from hack premium plugin authors. I am a professional plugin developer turned business owner with over 15 years development experience and my free WordPress plugins have been downloaded over 5 million times. My free coming soon page plugin for WordPress is a top 100 plugin on WordPress.org. I have loved serving the WordPress community for the past 5+ years and want to give this guide back. Many of the plugins I’ll be recommending, I know the plugin authors behind the plugin and can vouch for all them when I say they are made by people who love the WordPress community. Many of them contribute to WordPress core, help run local meetups and WordCamps, attend WordCamp and are active members in the community. So without further ado here the Best Plugins for WordPress Guide for 2018. A Backup plugin is the number one plugin you should install on your WordPress site even before you install a Coming Soon plugin. Lose any amount of work or a site just once and you’ll understand why. Fortunately it’s easy to do backups with these two plugins. I recommend these plugins depending on if the site is for yourself or for a client. If you are building WordPress sites for clients I recommend BackupBuddy by iThemes. They have a license that lets you cost-effectively resell a backup service to your clients. For example, you can backup up to fifty sites for just $150 per year. Plus you can bring your own object storage like Amazon S3 which makes it super cheap to store tons of data. If you just have one site I recommend VaultPress by Automattic. This is what I personally use on this site and it’s a set it and forget it solution. Backups are stored offsite by Automattic and restores are as easy as one click. Pricing starts at just $3.50 a month. If you are looking for a free just page caching plugin than look no further than WP Super Cache. It has a lot fewer features than WP-Rocket but gets the job done. Some people might say, what about W3 Total Cache. Well since this is my honest opinion I have had tons of issues with this plugin mostly due to the complexity and end users not knowing how to use it. If you are super technically maybe you’d enjoy it. OK, this one is hard. I’m going to list 4 plugins and it’s really hard to go wrong with any of these. They all will get the job done when it comes to creating simple contact forms to complex forms. I personally use Gravity Forms because I have been using a WordPress a long time and they were the only ones that existed when I got into the market. So first up Gravity Form. Gravity Forms is the oldest among the form plugins listed. But it’s still a tried and true solution. It has never failed me. Next, we have WPForms. It’s the new kid on the block but it was created by Jared Atchison, Syed Balkhi and Thomas Griffin. I know these guys personally and I can say that anything they make is going to be awesome. Looking for a great free Forms plugin? Than Ninja Forms by James Laws and team is an excellent choice. They have a unique form builder experience and provide add-ons for advanced functionality. While I have personally never used this forms plugin I know many people including many of my customers who do and I have only heard good things about it. Plus the owners behind the company, Steve and Stephanie, are great people. So everyone wants to add social sharing buttons to their blog post right? Well most people do, if you are one of those people then check out these two plugins. 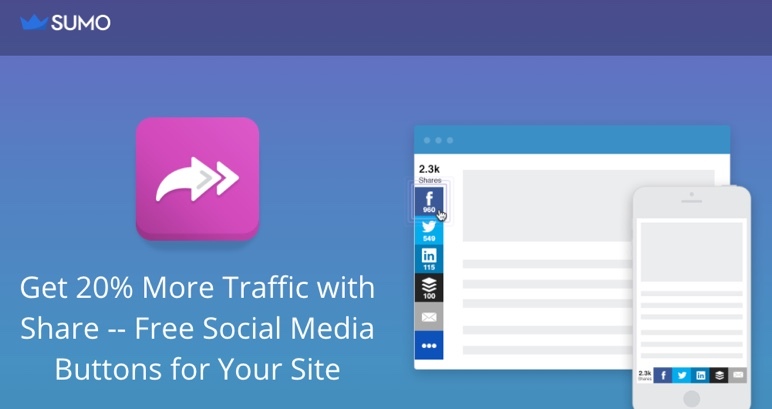 While not specifically a WordPress plugin, the social sharing app from Sumo.com is great. Ever wanted to build your WordPress site in your local development environment or on a staging server then migrate it to a live WordPress site. Then you need a site migration plugin and the best one without a doubt is WP DB Migrate by Brad Tournard and the Delicious Brains team. Security is a very important aspect to any WordPress site. Since WordPress is so popular it’s a very big target. So with that said you’d better have some way to protect your WordPress website. While some host have some sort of security layer you’ll probably want to take some extra steps to harden your website. I personally use CloudFlare Pro which protects my site from brute force attacks, DDoS attacks, and they have a Web Application Firewall to protect from other attacks. I pay $20 a month for this. But these plugins are great alternatives and all achieve the same thing, hardening WordPress. Most websites will want to capture leads and there are many tactics and strategies for capturing leads such as offering lead magnets, well time pop-ups and urgency notification bars. These are some of the best plugins to help you do just that. First up is OptinMonster. OptinMonster lets you create various types of pop-ups to help you captures leads and allows you to collect emails in exchange for a lead magnet download with their MonsterLinks feature. Next is my own notification bar plugin. With this plugin, you can create calls to action with urgency and captures leads. I use it on my own site all that time. Page builders are all the rage today in WordPress and there are many to choose from, but in my opinion, BeaverBuilder stands out among the rest. BeaverBuilder makes it easy to build out a WordPress site in a matter of hours. Plus if you pair it with their Theme and the Beaver Themer you can use it to build custom layouts, headers and footers in addition to custom pages. While WordPress comes with a built-in image gallery feature it definitely leaves a lot to be desired. If you are looking for advanced WordPress image gallery plugin then FooGallery should be your go-to plugin. It has many great features and capabilities for displaying, categorizing and filtering your photos for your website. It hides your real website while under construction so you can make a great first impression. It provides a way for you to collect emails and get people excited about your upcoming website. There’s no better way to set up a coming soon page for your WordPress website than with Coming Soon Page Pro SeedProd. Yep, I’m going to toot my own horn. toot, toot. This the plugin I started 5 years ago and is the most popular and trusted one for WordPress. I’m going to let you in on a little secret, you can actually add Google Analytics without a dedicated plugin. See this post to manually add Google Analytics to the header of WordPress your site. If you are going to use a plugin then check out MonsterInsights. In addition to adding the Google Analytics tracking code to your site, it allows you to track file downloads, popular post tracking, ads tracking and other custom dimensions. When it comes to e-commerce for WordPress the elephant in the room is definitely WooCommerce. It’s the most popular plugin for e-commerce period. It’s built by Automattic the company behind WordPress.com and has tons of flexibility and extensibility with its many add-ons. I recommend this plugin if you are selling physical products. And while you can sell digital downloads in WooCommerce I think another plugin does it better. That plugin is Easy Digital Downloads by Pippin Williamson and team. It excels at making selling digital product like ebooks, software and other digital files super easy. Need to take one off or subscription payments on your website with Stripe. Check out WP Simple Pay by my good friend Phil Derksen. It’s without a doubt the best plugin to take Stripe payments. Looking to set up a membership site for WordPress? There are many options to choose from but one of the best plugins for a WordPress site is MemberPress. It has an extensive feature set to set up just about any type of membership site you can think of. I recently started a podcast and the process if you have done it before was a bit complex. But this podcast plugin for WordPress makes it easier to get up and going. Also, check out my step by step by to creating a podcast with WordPress if you are setting one up for yourself. I’ll walk you through the whole process. Yoast SEO is one of the most popular plugins for WordPress with over 5 million active installs. It’s also one of the best when it comes to SEO. The free version of the plugin comes packed with many essential on-page SEO tools. It’s a must have plugin for every site. Need to create short links or hide links on your WordPress site than Pretty Links is the tool for the job. Unleash WordPress’s full potential as a CMS with custom content types and fields. If you build WordPress sites for clients then you are going to need a way to build custom content types. Advanced Custom Fields is one of the most popular plugins to do this. Plus it works with Beaver Builder’s awesome Themer Plugin to layout this custom content with a page builder. So these plugins are awesome and outside the categories I listed above. One of the first plugins I want to mention is a plugin called Redirection. Inevitably you will have pages and posts that get removed or moved in WordPress. Instead of throwing 404 errors on these pages redirect them to the new pages if it makes sense. To do that use the Redirection plugin John Godley. I’ll also note if you upgrade to the premium version of Yoast SEO, that plugin has a redirect manager built in. Another plugin that I use quite frequently is the Duplicate Post plugin. Its name is self-explanatory. It’s a simple but quite handy plugin. Another awesome plugin is JetPack by Automattic. This plugin does so many things it deserves its own plugin post. Check out my post on the 7 Features of JetPack you should be using. In addition to those seven features I listed it does much more. I invite you to install it and playing around see what features you like and need. Want to brand the WordPress login page or make it your own by adding your logo or some other customizations? 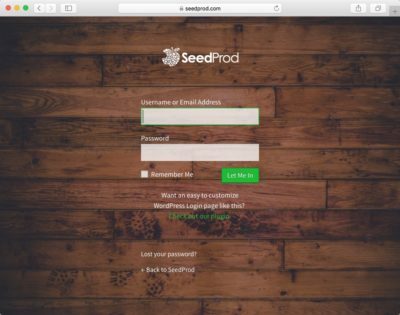 Then check out the Custom Login Page plugin by SeedProd. It makes it super easy to customize the WordPress login page and you can even see all your changes in real-time. If you have ever tried to send email from WordPress then you have probably experienced email not being delivered or going to the spam folder. This is because most all web host which that email would be sent through have terrible sending reputation and deliverability. Instead, send email through your Gmail account or through a 3rd party SMTP provider. The plugin I recommend to do this is called WP Mail SMTP by WPForms. So there you have it! My guide to the Best WordPress Plugins for 2018. Did I leave any out? Leave a comment below and let me know. Also check back often as I will be updating this post frequently as my list changes and grows. John is the founder of SeedProd.com and a WordPress Developer with over 15 years of development experience. 8 thoughts on "Best WordPress Plugins – The Definitive Guide (2018)"
I hope you don’t mind but for SMTP delivery I will add and totally recommend my plugin “Post SMTP” that forked from the popular plugin “Postman SMTP”. Great resource. I use many of the suggested plugins including Yoast, Super Cache, iThemes Security, VaultPress, and others. They are best plugins in the category and essential for any WordPress website. I recently wrote a similar post on my blog and co-incidentally I found your article. It was an interesting reading and very useful for the WordPress bloggers. Hi John, Great resources! Thanks for the list! We have built Backup And Restore plugin through which you can take or schedule backup on local server or cloud servers including Dropbox, Google Drive and Amazon S3. Any alternative to broken link checker because the plugin was last updated ten months ago. Although thanks For Sharing this list. Hey one more thing you have not listed updraft plus in backup category list. I am using this plugin with Dropbox remote storage and the plugin is working amazing. I think updraft plus deserves a place in backup category. it’s really an awesome Collections of wordpress plugin, but I think you missed the video player in your collection. because you added must have plugins for the website..